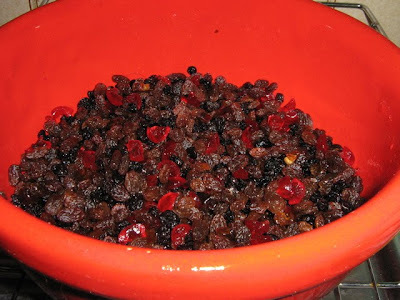 As threatened, I have made Deborah Strange Land's family's traditional Christmas cake, and it is in the oven. Deborah has beautiful photos of hers here so I didn't take bother to take any pictures of mine (particularly since my brown-paper wrapping on the cake tin looks like the work of a drunken three-year-old) except right at the beginning when the raisins, currants, sultanas, dates and glacé cherries were marinating in the brandy in the big red pottery bowl that S and P gave me one Christmas (I think) after I had admired theirs. (2) an acceptable alternative to almond paste/marzipan, which is the traditional undercoat for Christmas cake decoration but which makes many people gag, is a thing called Rolled Fondant that I found in Rose Levy Berenbaum's The Cake Bible, the instructions for which include a directive to wear all-white clothes while you're making it, because a single stray thread can discolour the fondant. There is one thing very wrong with this recipe, though. Either Grandma Strange Land or Deborah herself has inexplicably left the kitteh hair out of the list of ingredients. I'm feeling a little weepy reading about this. My grandmother died nearly 30 years ago now, but I cherish the connection I have with her, through my mother, and my lovely aunties (sadly, one of my aunties has died now too). I don't think that my grandmother would have been able to understand that a woman in Australia was making her cake, but she would have understood the connection from woman to woman to woman. I don't think she would have understood the men who cook and cherish domesticity; not within her ken. I'll tell my Mum that you're cooking her mother's cake. She will probably get a bit weepy too. Tell her I've had a lovely afternoon venturing out of my comfort zone. My ancient oven is nearly as feral as your grandmother's coal range or my mum's early-days-on-the-farm wood stove so there's no guarantee the cake will work out, despite its paper hat. But we live in hope. Deborah - I'm weepy too! PC, I loved this post, especially the ringing the loved relatives part. In Victoria brown wrapping paper can generally be found at newsagencies. What a lovely ritual. Think I'll make a cake this year just to connect with the "phone a friend" ritual. ps: kitty hair compulsory mystery ingredient this household too. Well I am moved by the bowl even more than by the cake -- especially as (of course) we broke ours years ago. Susan leaves the icing out of her Christmas cakes, which is, I believe, part of her family tradition. She has in the past also made a special one without glace cherries especially for the brother who can't stand them! Will it work equally successfully with dog hair? Nothing works like kitteh hair, but I'm sure dog would be acceptable faute de mieux. Mind you, the Patricia Cornwell I've just finished reading and am about to start blogging about says that wolf hair has magical properties. Do you have a wolf? I 'm a good family cook - Urbane Peasant type. I can't ever remember cooking a cake. Nor will I ever try. I was a bit disappointed with your post - I was reading in my usual skimming speedy way and just assumed that the prequel was that you couldn't find any muslin in adders - no not muslims - and so grabbed the happy pants as a substitute and they worked well. Add a bit of sly humour about the crutch being most suitable for hanging the pudding etc. I still think it would be a better story. Lovely post. SIgh. And good luck with that horrible heat. I didn't cry cos I'm a blokedy bloke. That's just something in my eye, okay? I had my Mum call me two years back from Perth as she was making her Mum's recipe for the first time without the old dear. She'd brought out the old Helping Stool - a little white-painted three-legged jarrah stool just high enough to get a four or five year old up to kitchen bench height for their first few years of Helping. It's now on its fourth generation of kids. The first Helping task was almost always xmas cake, though I believe mine was marron shelling. Fangs for the mammaries, as Dracula might say to Elvira.